Maximizing your yield is relatively easy to do and can increase your pay-outs while deceasing refining time. The idea is to send only the most valuable portions of your material by removing the portions which contain no precious metal. These 'base' portions of your scrap take time for us to remove and often take up a lot of space. Scrap with less 'base' material, is easier, faster and more profitable to refine, so you get a better, faster payout. 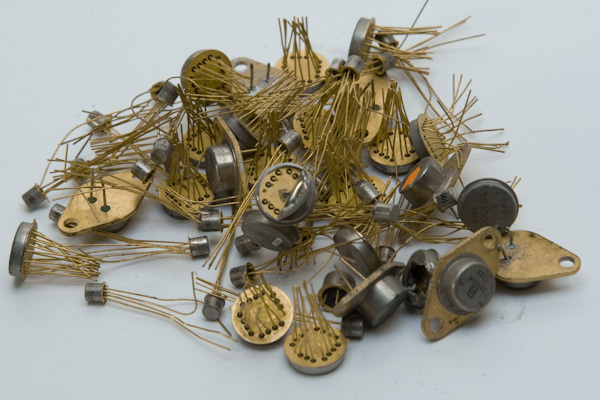 Very high quality electrical components that require little pre-processing to net a high yield. 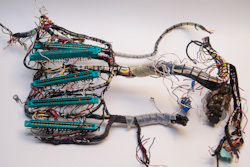 The Key to maximizing your electronics scrap yields is to identify the components that have precious metals, and remove all the portions that don't. In the photo on the right you can see that the components are almost entirely plated in gold. These components do not require any pre-processing; they can be set to us just the way that are. 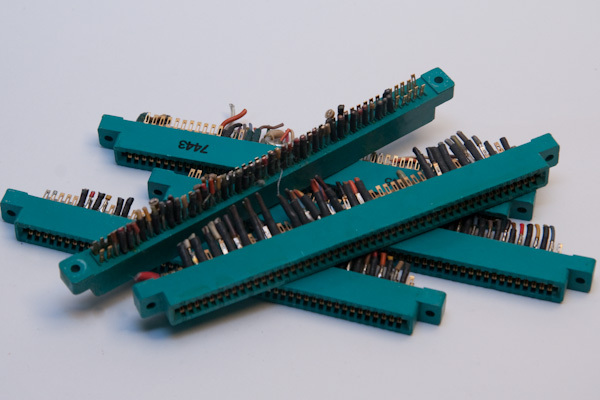 In most cases, the components are not all coated in gold; most electronics scrap only has gold on external connectors. This is because gold is a fantastic conductor of electricity, does not tarnish, and can be platted onto copper. This is great for when the components were being used, but not very useful to us now. The best way to maximize your yield when dealing with electronics scrap is to remove the portions of your material with no precious metal. Look at the photo below on the left. This piece of scrap material has a considerable volume of material, but looking closely (click to the photo to enlarge), all the gold is contained in the pins on the green connectors. In this case, portions of material with no precious metal should be removed before shipment. The yield would be greatly increased by sending in only the connectors, such as in the right photo. Lower quality electronics scrap with a lot of extra 'base' material. This sample will require a bit of work before it can be processed due to the volume of 'base' material attached to it. Removing the wires, bundles and other 'base' materials makes these connectors more valuable.